"Qasam" means divided, and this vertically seamed tunic is flattering on zaftig or willowy figures, tall or petite! It features a flattering soft-edged V neckline, but it's the construction that brings all the attention -- long lines that flatter and figure, perfect over skirts or your favorite pants. 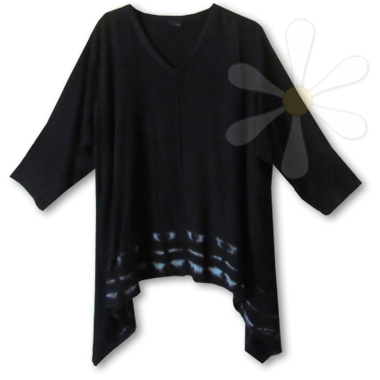 Unbelievably soft fabric, stellar construction, comfy fit... we're unanimous about this top! To order this top in regular dyes see our regular Qasam page.